Chris Harris + DaeSean Hamilton + 2019 2nd. I'd do Brown for McCaffrey, but there's no way Carolina would do that. McCaffrey would give us that stud 3 down back that is an elite receiver again. Bring in Conner for the heavy sledding, and utilize them both with McCaffrey out of the slot quite often as well. Considering Brown recently removed his current team from his twitter profile, id say he doesnt want to be here and there is a 90% chance he is traded. If you dont get a first round pick for him, then it has to be at least 1 2nd, 1 3rd and a future 2nd or 3rd. Preferrably 2 seconds and a 3rd. But i find it laughable Amari Cooper who isnt half as talented as Brown was traded for a 1st. He said he is open to staying, but its beginning to look more and more like he will be traded. Him and Ben apparently arent even talking...and thats a huge issue. If one of them would man up and make the first move, they might be able to mend some fences....but since both are self-centered twats, that wont happen. The egos of grown men. Why is it so hard to say..."This is where I messed up. This is where you messed up. My bad. Let's move on". It is so frustratingly childish. I might be in the minority but I believe he stays. He can't be traded for a while and I'm hopeful cooler heads will prevail in the meantime. Just don't ask me to bet on it. I mean...is Brown even taking phone calls? Because his own head coach hadn't heard from and couldn't get in touch. His owner couldn't. So, is Ben supposed to just call and text Antonio like some creepy ex until he gets a response? No, I definitely believe he could stay....but Im more convinced now that a trade could happen than I was a couple weeks ago. 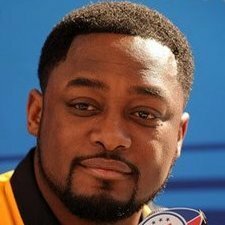 IMO, the Steelers should be doing everything they can to try to make the situation with AB and Be better, while at the same time, seeing what offers they get. IMO, unless they deem their relationship with AB to be unsalvageable, they shouldnt trade AB unless they are absolutely blown away by an offer....like getting a star player in return or a first and a future first. Even with everything that has happened, I know they could put their issues aside and move on. Whether they will or not is a different story. So, is Ben supposed to just call and text Antonio like some creepy ex until he gets a response? What would you do to end your career playing with the best receiver in the game? Why the hell wouldn’t you try to call? Problem is, Ben seems more than happy to take his ball and go home and Brown thinks he is so good he should get away with everything. There is a good chance these two don’t meet in the middle. I don't know that you guys are going to get a first round pick (though absolutely possible. Seattle has been willing to make trades like this, and a late first round pick for Brown would certainly make sense), I think you guys will get first round value for him. I don't think it's going to be a standalone second round pick or anything. I don't know that fans will be super happy with it (I mean, as a fan its going to be hard because everyone knows that as a player, Brown is flat out worth more than even a first round pick), but I don't think you'll be upset by it. I could see 2 second round picks. Maybe someone offers a flip in the first round and then like a third + fourth if you kick back a sixth or this years 3 + next years 3. That could make sense for a team like Buffalo. A jump from 20 - 9 is worth about the 40th pick in the draft. I could see a team like the 49ers potentially even offer up next year's first round pick if this years second is off the table from either team. If Ben and the team make an effort to fix the situation and Brown doesnt reciprocate, then its time to move on. In that case, best case scenario is Arizona offers us Patrick Peterson and a 3rd or something along those lines, and Brown leaves the AFC and goes to a team where it will be hard for him to get his usual stats....see how long it takes him to demand a trade there. As of a week ago, Antonio Brown still hadn't spoken to anyone on the team. Not the owner or coach. The reports we had indicated that Brown refused to take calls from Ben as well as everyone else before the Cinci game. You people apparently think he should drive to AB's pad and stand outside with a boom box until Brown rushes out in tears and embraces him. If Brown refuses to speak to those involved with the team, what realistically do you want Ben to do at this moment? More to the point - why the hell should it be on anyone on the team to fix this? Brown is the one who has to make things right here. This entire notion that others have to act to appease him is what created his sense of entitlement to begin with. Not a chance in hell we get that little. Not when Amari Cooper went for a 1st. Amari isnt even top 5, maybe 10 and AB is the best in nfl. Coops is just 24. Brown is 30. Age plays a factor, but Brown is light years better than Cooper.